Marvel has taken a shotgun approach to the themes of its movies. From the self-serious (any Captain America movie) to the ponderous (any of the Avengers movies). From the comic (Guardians of the Galaxy 1 & 2) to the meta (Deadpool). Rarely have they touched on any subject that is of great import to current society in a real way. That is until now. BLACK PANTHER checks that box in marvelous fashion. I’ve spent days attempting to write this review. Then i realized I cannot fully appreciate how great it is or may be. I cannot fully appreciate the messages it is sending about being black in 2018. I never could. I can be empathetic to its message. I can understand the points it is trying to make but I can never feel it in my bones. And this is a film that is deeply felt. Again, that is very weird for a movie in the superhero genre. Marvel seemed to be taking a chance in handing the reigns of this origin story to Ryan Coogler who has made exactly three full-length feature films. But was it really that much of a risk? He is the young genius behind FRUITVALE STATION and CREED. It should have been safely assumed that this would be the most thoughtful, socially significant Marvel film we’ve seen. What really helps focus this film is the goals of the heroes. King T’Challa is not trying to save the world, just his little corner of it. We first learned about Wakanda in CAPTAIN AMERICA: CIVIL WAR. We saw his father die in an attack on the United Nations and learned a little about Wakanda’s rich deposit of Vibranium, the material Cap’s shield is made from. There are several tension points. T’Challa’s (Black Panther) internal struggle on how to be a good king, a job he was not quite ready to assume. There is pressure from Wakanda’s tribes on what kind of country they want to be. Continue hiding in plain sight from a world that believe it to be a third world African nation or share its secret power to help lift the oppressed. That conflict is put to the test when Eric Killmonger shows up to challenge T’Challa’s right to the throne. Killmonger’s goals may align with those who want Wakanda to reveal itself, but his motivation comes from hate not altruism. This thoughtful script (co-written by Coogler and Joe Robert Cole) raises issues of isolationism, nationalism, jingoism, racism and altruism that are prevalent in modern American society. It is nearly impossible not to notice the parallels. And all this is wrapped in a great superhero movie. As I’ve written before, one of the things I want to see in these movies is the main guy using his powers. There are several great set pieces featuring Black Panther being his Black Pantherist. There is cool tech on display and the hero being, you know…heroic. They are not destroying worlds or demolishing cities. it’s small and wonderful. The cast is simply amazing. There is not a weak performance to be seen. Chadwick Boseman does great work as Black Panther. He is thoughtful, but not weak. Confident but not cocky. 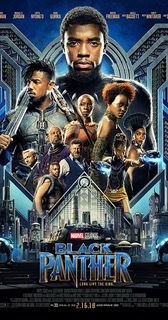 The other highlights for me were Letitia Wright (T’Challa’s sister Suri, who is also the genius behind Wakandan tech), Michael B. Jordan (Killmonger), Daniel Kaluuya, Danai Gurira (Okoye, the head of the Dora Milaje an all female unit in charge of protecting the King) and Winston Duke. That’s not to diminish the other performaces, but those all were a notch above. I feel odd talking about it being a nearly all black cast. That shouldn’t be a thing we have to mention, so now that I have I won’t talk about it again other than to say BLACK PANTHER’s shattering of box office records should put to bed any notion that race has any impact on those who buy tickets. If the movie is good, they will show up no matter what. BLACK PANTHER shatters so many stereotypes, all while being politically current and entertaining. That is what makes it a film you must see. For a movie set in the shadows of Disney World, THE FLORIDA PROJECT owes nothing to any Magic Kingdom. Sean Baker (TANGERINE) has figured out a way to tell a story of people living on the margins. The live near Disney, but that is close as they will ever get to the tourist attraction. Close enough to see, but not be part of the fantasy. The adults act like children and even though the kids act like children, they are forced to care for themselves like the are adults. These are people left out by the rest of society. 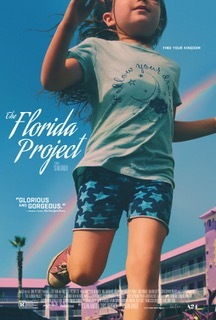 Moonee (Brooklynn Prince) and her mother, Halley (Bria Vinaite) are forced to live in a motel located just down the street from Disney World. They have no place else to go. Halley is barely an adult herself and earns what little money she has selling perfume, or hustling stolen park wristbands or just simply hustling. It is a miserable life. Bobby (Willem Dafoe) is the motel manager who is also sort of a de-facto babysitter. He doesn’t want the job, but someone has to keep an eye out for the kids who run around the motel and neighboring businesses with abandon. The kids start out uber annoying. I kept thinking to myself, “why can’t anyone control them”? But then as things move along, you realize that no one can control them. There is no one to control them. They all are from single parent homes. The parents are working. It’s summer so they have no school to go to. No family to stay with. They would have to scramble and climb just to reach the top of the crack they fell through in society. It is sad and pathetic and gut wrenching. You wait for someone to come to help. But there is no help coming. Only county child welfare officials who are doing whatever they can, but they come off as the bad guys, or the worse guys, because there is no good guy here. Only Bobby seems to be trying to do the right thing, but even his efforts are minuscule in the grand scheme of things. So you must be wondering by now, why should I watch this pathetic story. Because it is magnificently executed. You hope against hope that things will get better. You root for something good to happen. Baker draws you into this world he’s created and makes you care about these broken people. Brooklynn Prince is amazing. I mean, she is acting like a 6-year-old. How Baker corralled that into such a wonderfully touching performance is a feat to behold. Bria Vinaite is an Instagram star. So how did she land this? I don’t know, but she is fabulous. You feel how much she cares for her daughter, but also how lost she is in the world. Dafoe’s nomination for Supporting Actor is richly deserved. Usually he plays the villain or some kind of oddball psycho. Here he plays the nice guy, totally against type and he is wonderful. THE FLORIDA PROJECT is a tough movie. It is full of brightly colored buildings and dimly colored people. It is a film i keep thinking about. Thinking about how people could live like this because it is so outside my experience. And great art should make you consider worlds you are not familiar with. It should make you reckon with it. And that’s what makes THE FLORIDA PROJECT such a great film.